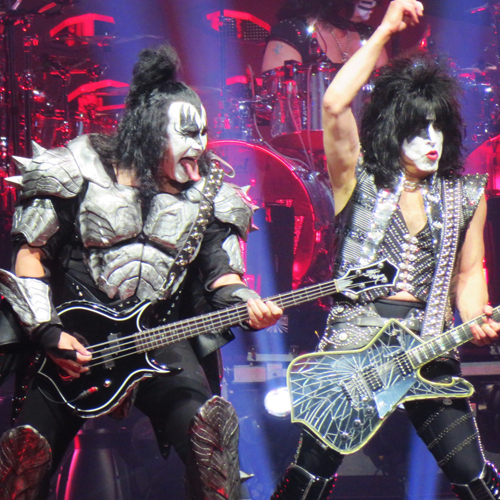 KNAC.COM - Reviews - KISS Live In Ottawa, Canada With Photos! Hard to believe that after close to five decades of touring, recording, performing in 40-pound suits of body armor and layers of makeup and, indeed, rock and rolling all night and partying every day, The Hottest Band In The World, currently comprised of Paul “The Starchild” Stanley, Gene “The Demon” Simmons, Eric “The Cat” Singer and Tommy “The Spaceman” Thayer are nearing the climax of their illustrious career. 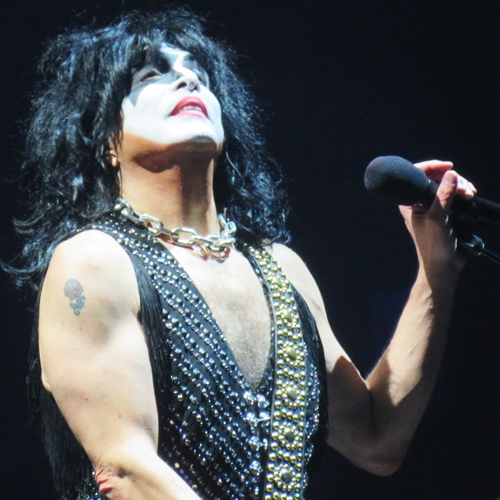 It’ll likely be another two years before they officially reach that final landmark date, but they’re determined to celebrate their legacy with leaving their indelible, influential and identifiable brand of shock rock and showmanship wherever they’re stopping at on the End Of The Road Tour, including at Ottawa’s Canadian Tire Center for a near-sold out show (it was a Wednesday and worth bailing on Toastmasters to attend) of just over 15,000 fans – among them myself and my friend James who wanted to make sure that his extra ticket wasn’t going to waste after his original date for the show was unable to attend. The show itself was a celebration of art and its interpretation in different forms, and, to be honest, as there were few active current bands worthy of matching the headliners on this tour, it made sense that the opening act was an actual artist in their own right. That would be “artist” as in “person with a canvas and cans of paint” for the record. And that artist in particular would be accomplished Brooklyn-based performance painter David Garibaldi, known for his conceptual artwork of rock musician portraits painted in quick cadence and timing to the music of the same musicians he’s painting. We’d arrived in time to see him create a near-perfect likeness of late TRAGICALLY HIP frontman Gord Downie to the sounds of “Ahead By A Century”; the painting was created throughout the song’s duration of 3 minutes and 43 seconds, with the standing ovation he’d received for his work taking longer than the time to paint the portrait itself. His top piece of the evening to show his appreciation for landing the opening slot on this tour was a portrait of the headliners’ makeup designs with the Canadian flag in the background. “Give it up for the Hottest Band In The World!” he encouraged the crowd to applaud as much for his own work as they would once the chugging riff for “Detroit Rock City” and the barrage of pyro eventually followed his performance. Garibaldi is definitely a skilled artist in his own right who put his own touch of color during this show. Get the earplugs ready because those notable guitar and bass riffs are about to literally blow up for perhaps the last time. 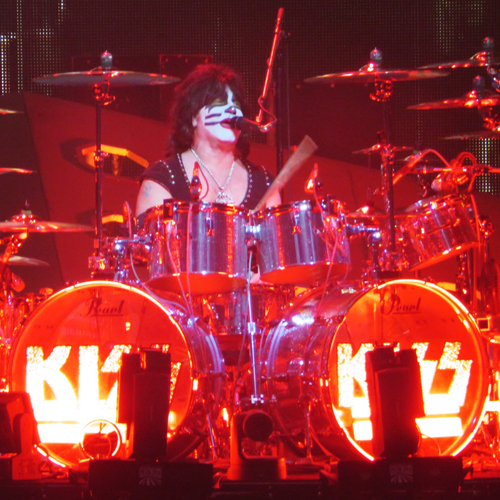 The octagonal platforms carrying Gene Simmons, Paul Stanley and Tommy Thayer lowered the trio to the stage as Eric Singer’s sticks ran roughshod across his drumset during the aforementioned opening literal banger “Detroit Rock City”. “How ya doin’, Ottawa!” Stanley bellowed from the stage in between vocal breaks. So did the various displays of pyrotechnics, colorful lights and flaming bouts of fire that accompanied the hooks and highlights of each and every one of their hits they’d played that night. The opening number was followed by the equally slammin’ anthemic numbers “Shout It Out Loud” and “Deuce”, their timed pyro breaks in parts sounding right on cue. 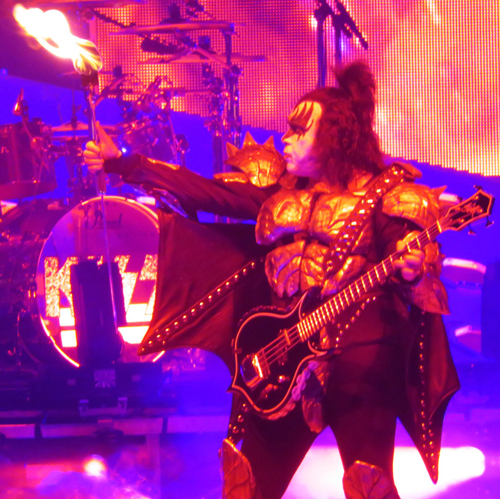 Stanley’s voice is in fine form for someone on the cusp of the age of 70 as he greets the Kiss Army faithful in attendance, some clad in replica Demon/Bat Lizard armor and platform boots and varying Demon and Starchild face paint. 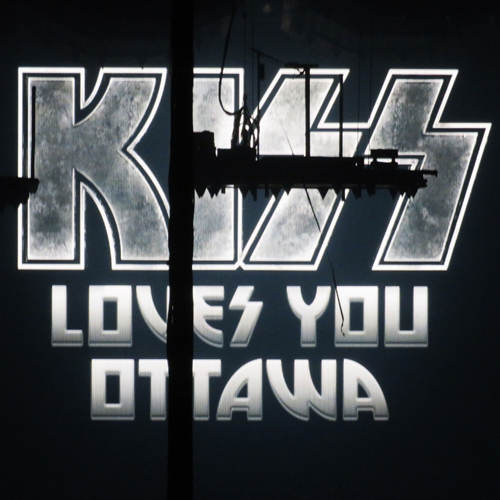 Some of the faithful likely weren’t around when KISS made their first Ottawa appearance at the former Civic Center in 1976 which Stanley had referenced in his introductory address. “You people have always been awesome.” he reminded everyone as the quartet continued their 2-hour hi-energy performance. Throughout the show, photographic memories of the band’s history were displayed about on the life-size backdrop stage screen and even some first-ever homages to some of the band’s influences – a cool mashup medley of “Lick It Up” and THE WHO’s “Won’t Get Fooled Again”, complete with a similar light show coming to mind here – and earlier members were showcased even though the split between both parties in some cases were less than amicable. One such tribute was in honor of the original Spaceman Ace Frehley, whom Thayer dedicated his solo set to with an actual Space Invaders-inspired stage set in which images of flying saucers appeared both on the giant backdrop screen behind him and upon the octagonal platforms; each time Thayer pointed his guitar at one of the flying saucers on the platforms, a fiery laser appeared to shoot from his instrument and blow up the spaceship. Loud as hell, but rather cool from all angles. 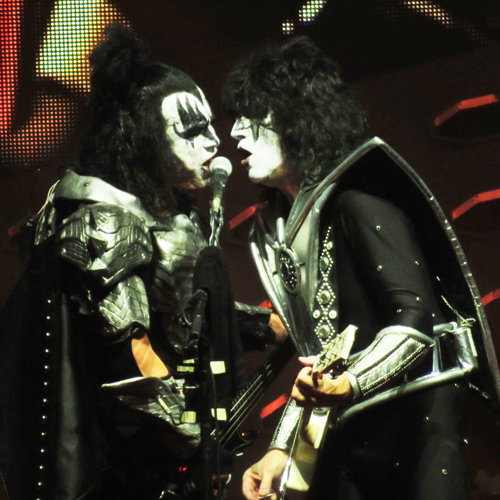 I know I hadn’t seen it at KISS’ Bluesfest set almost a decade earlier which had been notable for Paul Stanley calling out a couple of edgelords starting up a pit during “I Was Made For Lovin’ You”. Luckily, the closest to any rough crowd behavior I’d seen at the show were of the couple sitting in front of us, the girlfriend clearly sloshed and spilling her beer all around her including on the steps. James and myself must’ve warned about a dozen people coming up and down to be careful of the mess near them for fear of slipping. Afterwards, then came the zip line. More to the point, then came Paul Stanley on the zip line making his way towards the middle of the crowd onto a nearby platform as he arrived to belt out “Love Gun” and “I Was Made For Lovin’ You”. 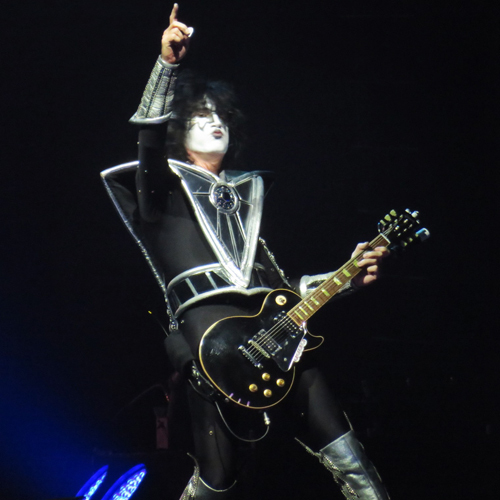 No moshpits were reported throughout that performance out of respect to the Starchild, who was having too much of a good time to be babysitting a crowd of 15,000 that night. 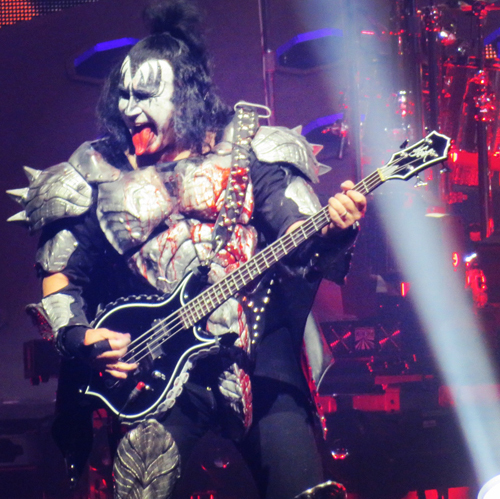 Gene Simmons alone would’ve been intimidating enough during his performances to dissuade circle pit action on heavier KISS numbers such as “War Machine”, “I Love It Loud” (featuring his trademark fire-breathing stunt) and “God Of Thunder” (featuring his trademark blood-spitting stunt). 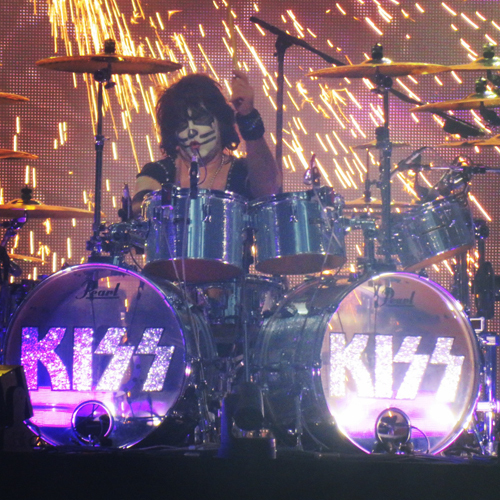 Climaxing the show with Eric Singer’s solo rendition of “Beth” which brought out the other three members to take a few appreciative bows for the audience, followed by “Do You Love Me” and an explosive rendition of their signature hit “Rock And Roll All Nite”, KISS saw off their Ottawa show in a flurry of explosions, confetti, more explosions, fire, light shows and even more explosions (and Paul Stanley smashing up his guitar Pete Townshend style). 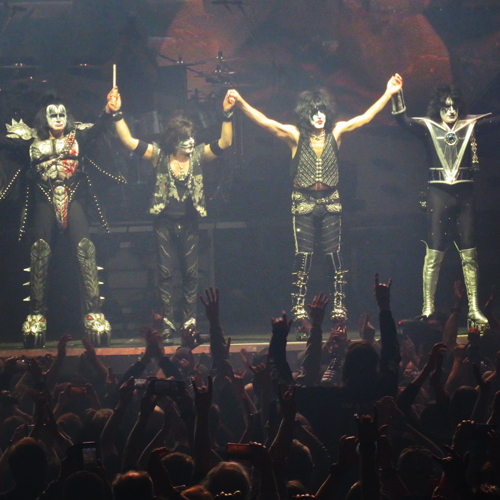 The End Of The Road Tour wasn’t just a milestone for KISS to end their lucrative career on during the Canadian leg of their world tour (though they’ll definitely be touring for another two years straight and include another North American jaunt or two, including a Montreal visit on August 16, before they hang it up for good). It’s also a shining and fire-breathing bond that the band have forged with us since they emerged on the scene in the early 70’s. Their first headlining tour was actually in Canada including their Civic Center show. They inaugurated the opening of the Canadian Tire Center back when it was known as the Corel Center when it opened in 1996. Famed rock journalist Mitch “Rock Talk” Lafon got his first break in the business when he interviewed Gene Simmons at age 11. Even my first concert review for KNAC.COM happened to be KISS’ first “farewell” tour with the original lineup nearly 20 years ago with Ted Nugent co-headlining, which also happened to be my first KISS concert. And it’s been a wild ride in between. Thanks to my neighbor/friend James for the extra ticket and even some of the better photos from the concert which he’d taken during the show. And thanks to KISS for 46 years of smashes, thrashes and hits – and for three reviews for KNAC.COM I can be proud of. Just as you can be proud of your own legacy.